To say that I love this book would be putting it lightlyMy family adores me - and in part that's due to the frequency that I rely upon this book for recipes. I have such a enjoyable time trying these recipes that I end up begging to make the family's meal. (And the meals turn out so good that my sibling doesn't even mind that I usurped her position as family favorite).After delving into the Bucholz's The Unofficial Harry Potter Cookbook, I knew that I had to try another of hers. 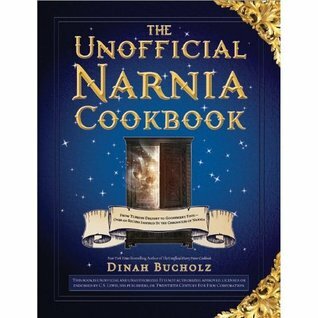 Ergo, I totally read the entire Chronicles of Narniaseries to "earn" this cookbook.That's right. Seven books in order to read one. Seems about fair (ha! ).And let me tell you, this book is fabulous. The instructions are simple and efficient, there aren't too many hard-to-get ingredients and the recipes are absolutely fun. Each recipe in the book starts with a passage quoted from one of the seven Narnia books and then goes into how to make it as close as possible to what it was in the book. Sometimes there are sidebars with further information regarding some of the more unusual techniques or ingredients.After reading this book, I am so pumped to cook. Every meal I've tried so far - from Cornish pasties to roasted chicken to tea cakes - has turned out delicious. Highly recommended for Narnia fans - or just for fans of good flavor.I can't wait for Bucholz to tackle another series. My speedy perusal of this book resulted in the hasty conclusion that I would probably never try any of these recipes. However, my sixteen year old actually read the introduction and carefully paged through the book. She says we need to own all of Bucholz's books. So be it. Despite there being absolutely no photographs or illustrations, the recipes are well researched and a valuable instruction manual for preparing less familiar meals.Here chapters are: "Beautiful Breakfasts", "Snacks, Teas, and Meals on the Run", "Lunch and Dinner Menus", and "Fabulous Feasts".My teen summarized with this remark -- "She needs to tackle the Redwall series. Do NOT, I repeat, DO NOT read Redwall on an empty stomach." I didn't know. There’s a lot of recipes here – some even look mildly interesting – but there is very little link to the Narnia books. I suspect copyright issues, but given how awesome The Unofficial Hunger Games Cookbook was, I confess myself thoroughly disappointed with how hard Bucholz dropped the ball. Overall, just embarrassing to watch as she makes a right little fangirl fool of herself. Another winner! Incredible research, fantastic writing, mouthwatering recipes, and the perfect dash of humor to tie it all together. Dinah Bucholz serves up another wonderful treat. Whether you're in the mood to whip up something delicious, or just to snuggle up on the couch to enjoy a great read, this is the book for you. Narnia fans will be transported to that magical kingdom, and those who have never read the books will want to be transported too - to the nearest library/bookstore to savor the series - and keep this great cookbook handy in case you get struck by the urge to try some of the tempting foods as you read about them! I enjoyed it and look forward to making snacks and recipes to go along with our current bedtime story regimen (reading through the Narnia books at the moment). Not quite as good as the Unofficial Harry Potter Cookbook by the same author which was so excellent I've given copies away to friends and use it regularly to cook non-themed meals. Love this cookbook! The Narnia books are my favorite series and a friend of mine who works at the library gave me the heads up on this book. Lots of fun recipes for all cooking skill levels. If you are a Narnia fan and like cooking/baking then take the time to check this out! I knew about the Turkish Delight, but I never realized how many different types of food were mentioned in these. Some of the recipes use substitutions, but I'm glad she included some of the more odd meats (like calves tongue). It makes the book seem more authentic. Ahhh, Narnia. Will definitely own this when I have kids one day! great cookbook about the foods in narnia! Dinah Bucholz - Dinah Bucholz is the official author of The Unofficial Harry Potter Cookbook. Dinah was born to a large family and grew up in a small New York City suburb called Monsey. The most exciting things that happened in her childhood were getting her pony tail pulled by various brothers, also getting teased by the same, and enjoying spectacular good times and spectacular fights with her twin sisters.Dinahs first experience with baking occurred when she received for her ninth birthday a toy mixer from her mom that actually worked. She mixed up a chocolate cake batter without following a recipe and then poured the brown glop into plastic bowls and set them in the oven. Thankfully, she forgot to turn the oven on.Dinah went on to bake many more chocolate cakes and it wasnt long before she was making fine desserts and cooking delicious food had become a passion second only to eating it.Today, Dinah lives in Philadelphia with her husband, and to the sorrow of her four children, no pets. She spends her time cooking and writing and wearing a professional-looking white chefs apron when she remembers to put it on."